The vehicle utilises petrol to recharge its battery and can also be charged via plug-in. At times, when petrol as a fuel is being used abundantly, the need for innovation is apparent and this requirement has been met by EEE students of PSNA College of Engineering and Technology, Dindigul, who have designed a hybrid auto rickshaw powered by solar and wind energy, further aided by use of petrol, which is used only to recharge battery of the vehicle. While, plug in charging facility is also available. 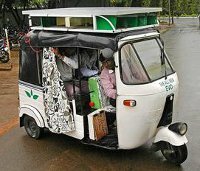 The auto can run for about 80 km continuously on full charge carrying four passengers and it can travel up to 96 km with solar energy and wind energy. Interestingly, this auto results in fuel emission cut by 90 per cent. PSNA College of Engineering and Technology, solar auto, wind auto rickshaw, South India, cutting cost, plug-in recharge, recharge via petrol, 80 km a day, solar power, EEE students, solar energy, solar vehicle. The project has been developed under assistant professor J.E. Moshe Dayan, who says that hybrid auto has an internal combustion engine, a switched reluctance motor, wind turbine, photovoltaic system, and an energy storage system. The auto runs on electric mode, cutting down pollution and ensuring fuel consumption, he adds.With this, auto driver can save up to Rs 250 a day. Industries have played their part in ensuring, the vehicle reaches completion. In this regard, charge controller units, deep-cycle discharge traction batteries and attenuator have been provided. The team had worries over over-weight of vehicle due to battery and wind turbines, which was quashed by localite mechanic Raju, who has fitted car shock absorbers for vehicle stability. The project has already received its recognition after being ranked fifth among top 20 best innovative projects at Joy of Engineering and Design-innovation (JED-i)-2012, conducted by Indian Institute of Sciences.